Les Amis has most certainly chosen a location that’s unlike the rest of its other concepts. 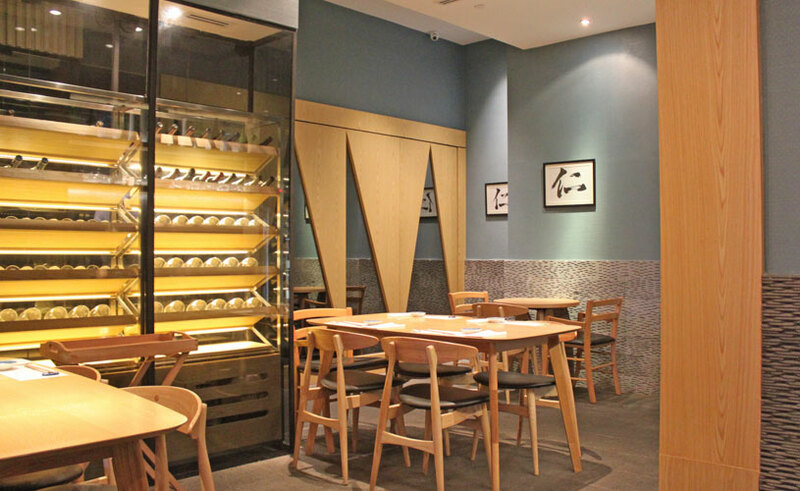 Sushi Jin is its latest concept set in Singapore’s cultural district, Little India. And while the location seems a tad off city centre, it’s extremely accessible from the Farrer Park station, sitting within the One Farrer Park Hotel and Spa premises. It all begins with the fresh produce that’s encased within the gorgeous cypress wood serving counter, something that’s utterly convenient for the chefs and perfect for the curious counter experience with everything in plain sight. 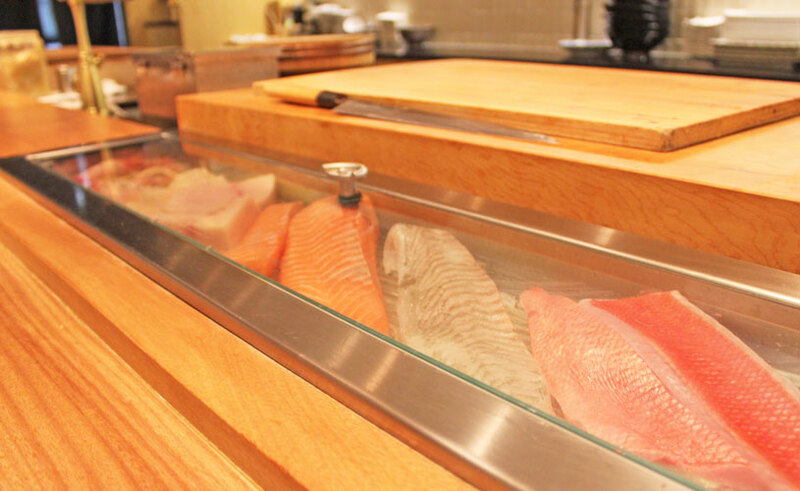 Unlike the more traditional sushi counters that you feel a little intrusive when you try to peer over it. Two amuse bouches are rather generous I must say, and it started with the marinated tako with ebiko roe. 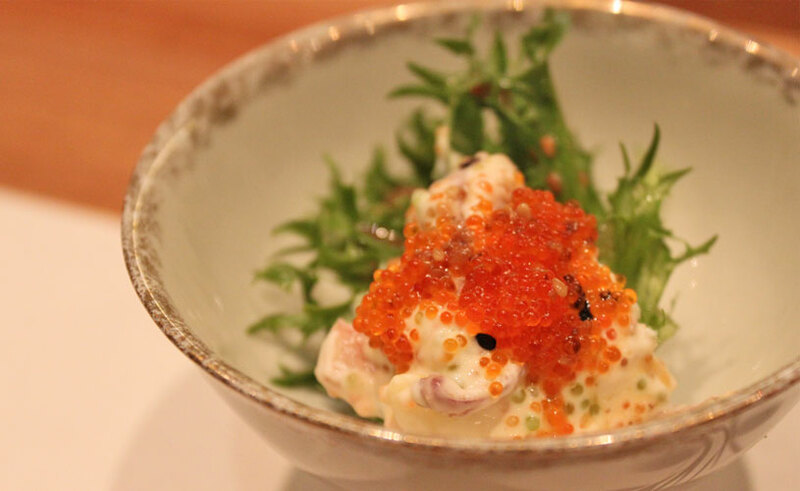 Deliciously textured with the roe, octopus and the light mayo, the sea snail came as a starker contrast. 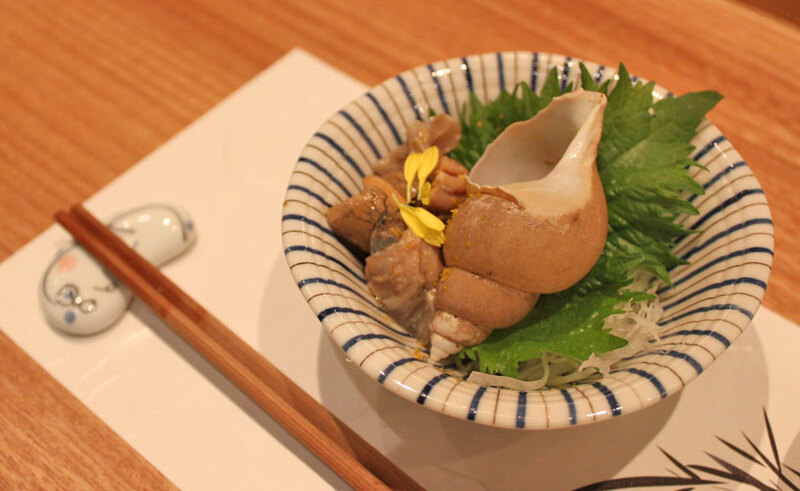 The meat is firmer, and similar to abalone in texture, with the same mild sweetness. If you’re not a fan of innards in general, I’d say avoid them because they did have a taste profile similar to kidney. 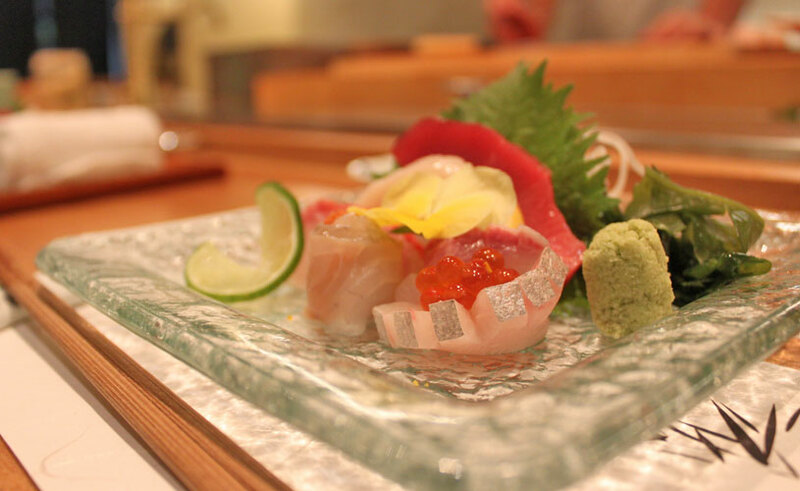 The Kampachi Carpaccio had a combination that can’t go wrong. 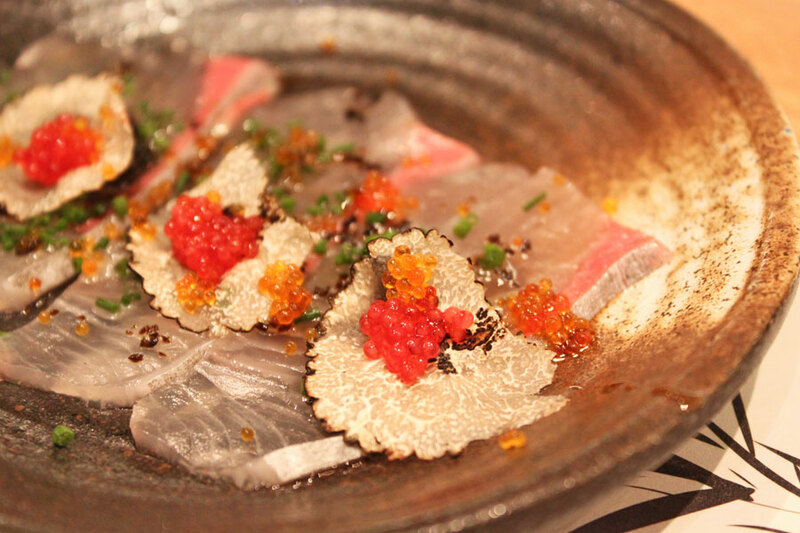 Fresh slices of amberjack topped with truffle paste, a slice of black truffle, seasoned ebiko roe and fragrant chives, each mouthful was an umami explosion that made you want more. The Sashimi Moriawase is a platter of high quality sashimi cuts, starting with the yummy Chutoro (medium fatty tuna belly) which I had to go for first. It’s sacrilegious to overdo it with the freshly grated wasabi and shoyu so I dipped a little and allowed the juicy chutoro to melt into my palate slowly, chewing it as many times I can to release the luscious fats. 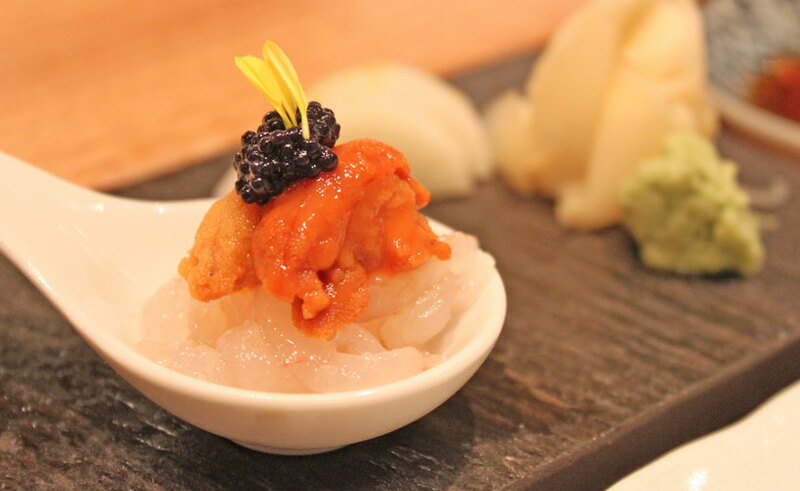 The other cuts of amberjack (suped up with a dollop of uni), swordfish with ikura, and a fleshy, fresh scallop were all delightfully different in texture and tastes as well. 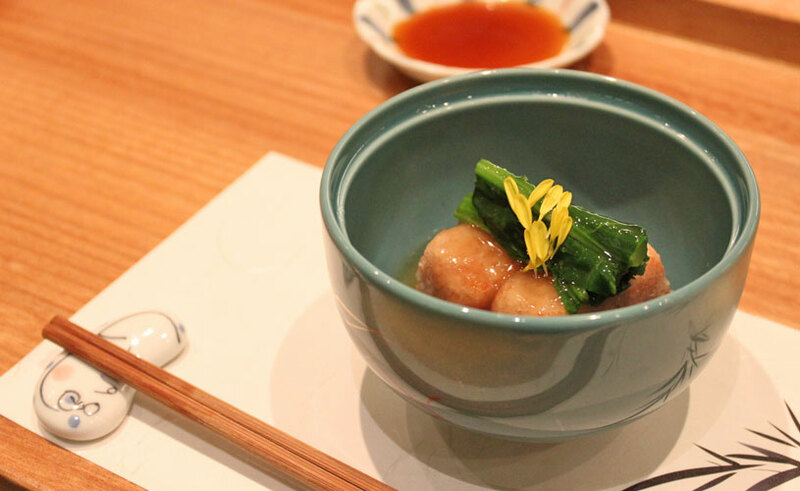 The Imo Taro is a deep fried taro that’s surprisingly light, with a gentle crisp, and yet creamy in texture as you chew into a soft, seasoned block of taro. 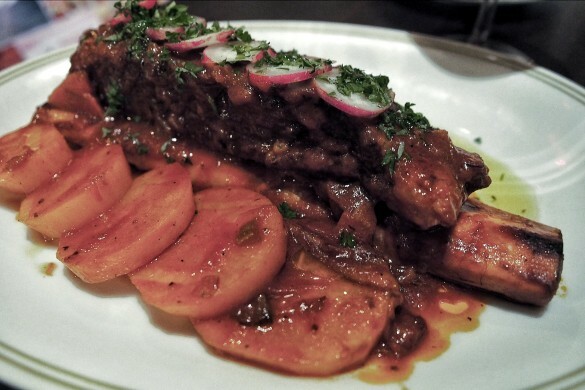 One of our favourite dishes, despite being just simply a root vegetable. 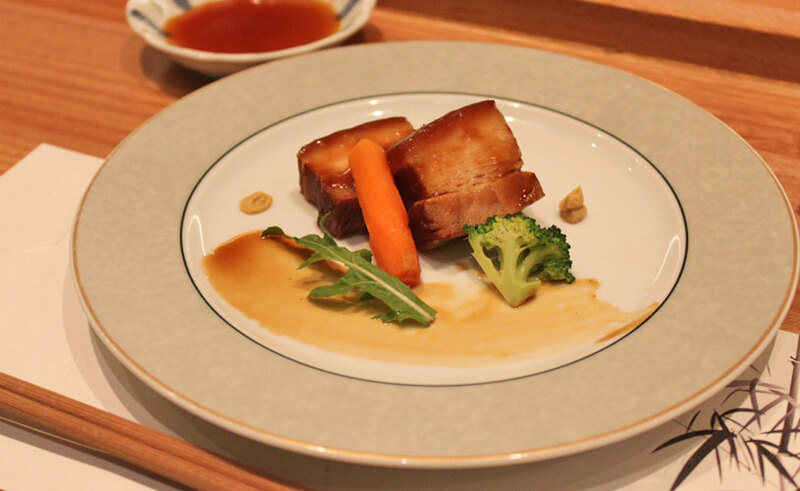 The Buta Kakuni is a perennial stewed meats favourite and this version is as good as it can be although we would have preferred for it to be braised longer to get it more tender. 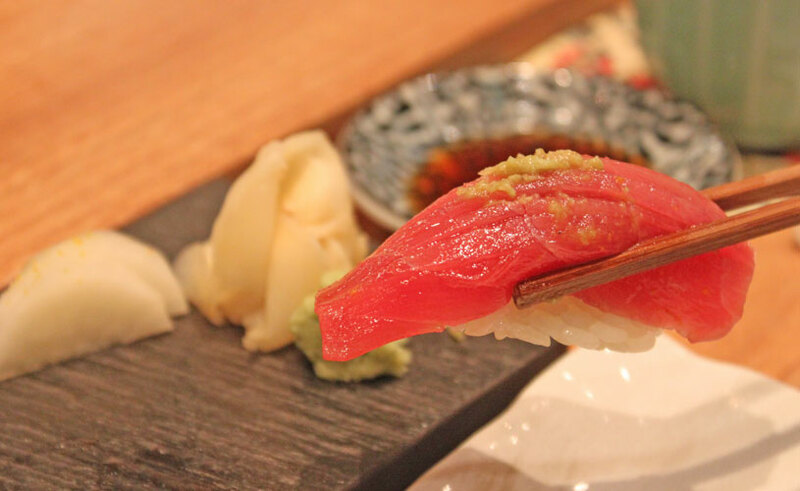 A good nigiri doesn’t only hinge on the the freshness of the raw fish on it, the seasoned sushi rice makes up a really big part of it. 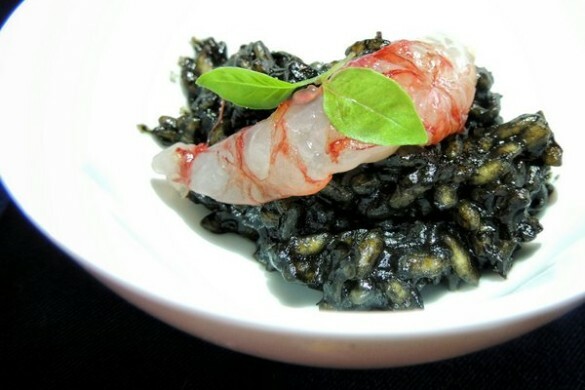 And of course, other things like the ratio of rice to raw fish. Sushi Jin has gotten the sweet spot in my opinion, getting the proportions right. We had flounder, sea bream, an aburi otoro, a side of uni on shiro ebi, and an amazing trio of uni, foie gras and scallop. 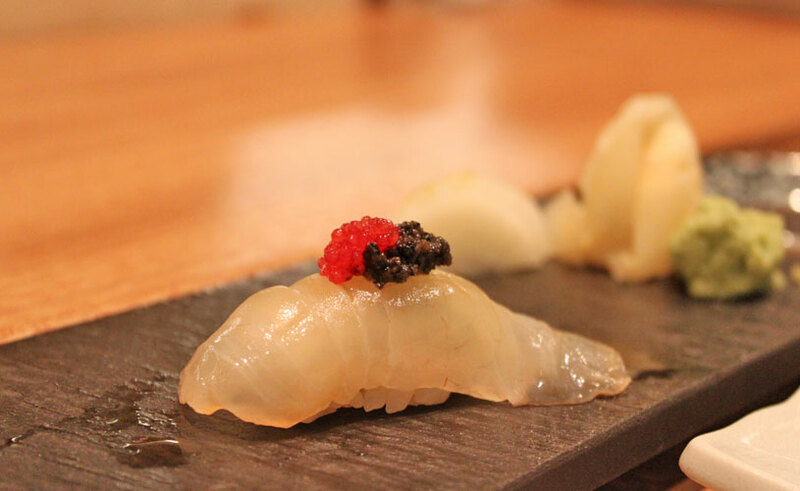 The sea bream nigiri sushi was served with ebiko roe and a smidge of truffle paste, giving it a very interesting twist that you wouldn’t typically expect from a nigiri. 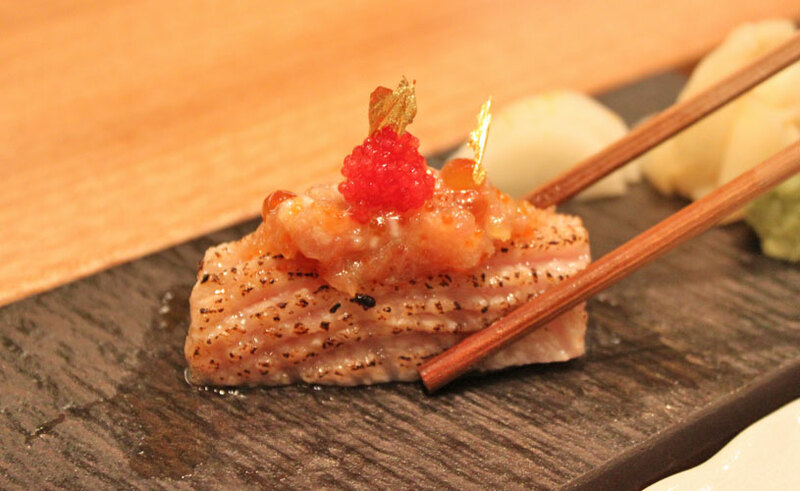 The aburi otoro is adorned with seasoned tuna and the sear caramelises the fat, releasing the smoky flavour, and natural sweetness of the premium cut, and the gold leaf garnishing definitely raised the visual profile as well. This was utterly creamy and delicious. 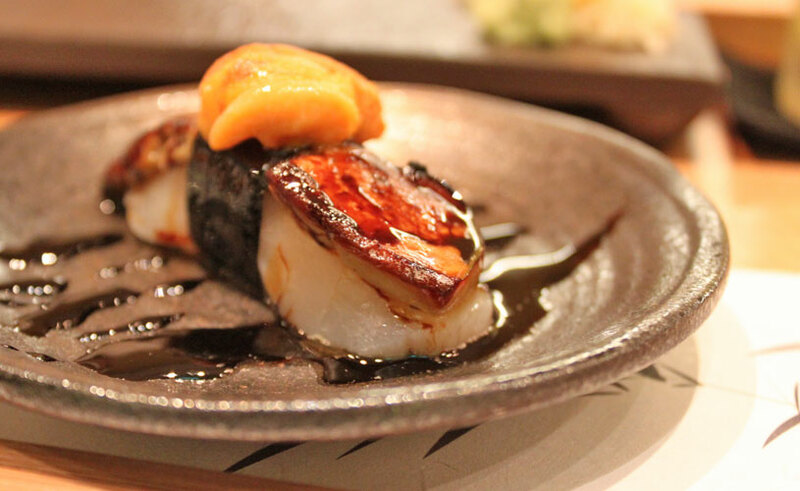 The finale for nigiri set was the trio uni, foie gras and scallop. The sweetness of the fresh scallop wasn’t overpowered by the unctuous, fragrantly seared foie gras and that dollop of uni was just adequate. Pacing the richer tasting nigiri to the end was perfect as it would have really overshadowed the rest that had more sophisticated flavours. 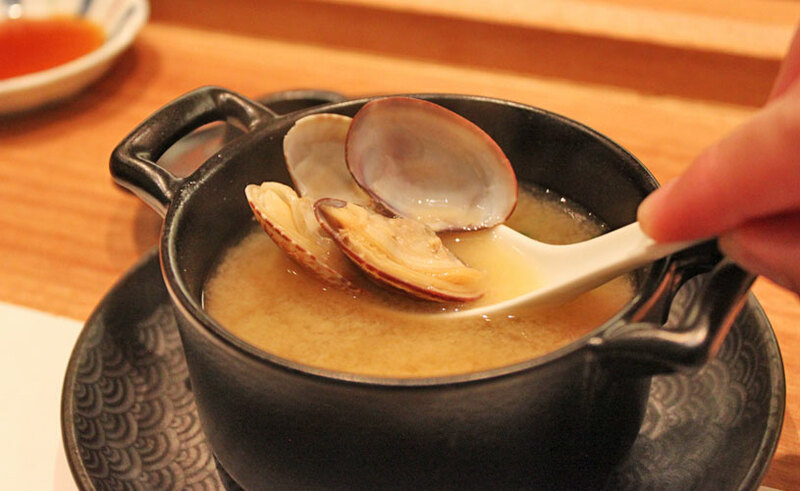 After an extremely satisfying meal, comes a really light close in the form of clams cooked in miso broth. 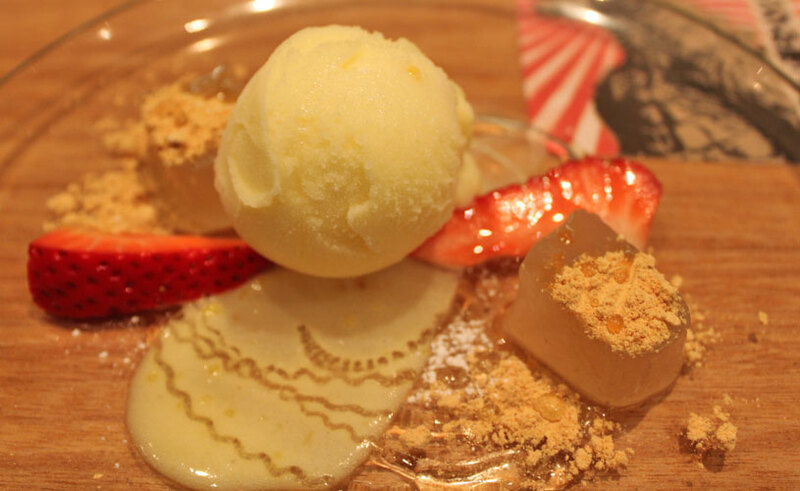 Dessert was a combination of a yuzu sorbet, fresh strawberries, aromatic warabi and chewy mochi – a great way to end the meals, light. 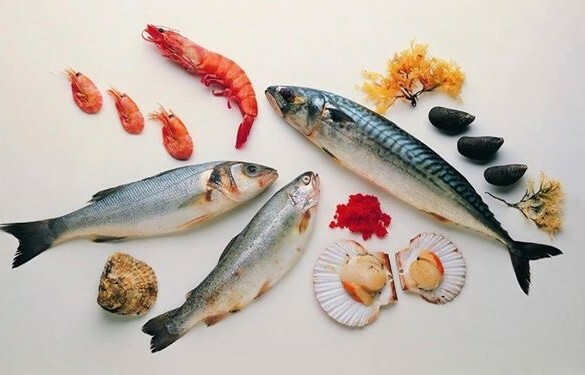 A testament of a good Japanese restaurant is how the freshness and flavour of the produce still persists, and uplifted with other condiments added. 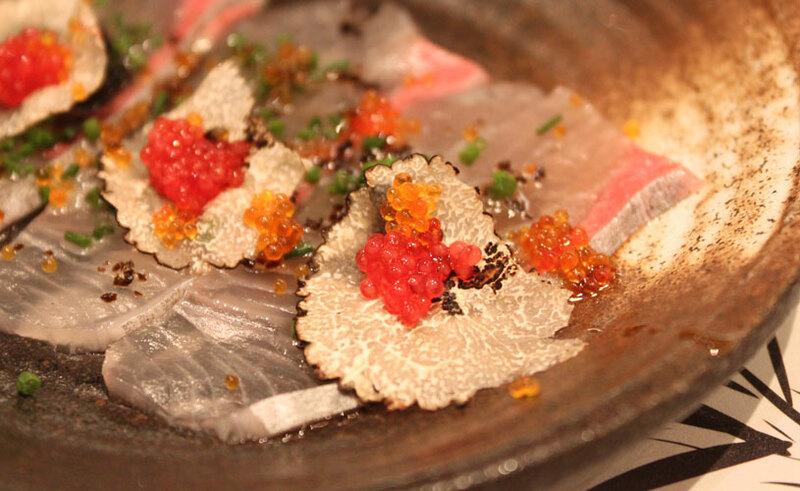 Sushi Jin by Les Amis has chefs at that level of mastery, and yet with the creativity to go beyond the traditional ingredients, spinning modern flavours into it. Simply worth a revisit, really soon. What kind of traveller are you and how early should you check-in at the Changi Airport?